step by step, using plain English rather than legal jargon. Yes! FreeWills is 100% legal in England and Wales. FreeWills was built with extensive input from will writing experts. Yes! FreeWills is 100% free. There are no charges whatsoever for you to make a will with us. Yes! You can create a new will to replace your old one. Naturally, there is no charge to do this. Our business ethos is one of honesty, credibility and dependability. We provide a unique will writing wizard software to create a highly personalised will. Our software was created in conjunction with experts in estate planning, will writing and UK law. We created FreeWills with leading specialists in estate planning and experts in UK law. We use the latest in Internet security to ensure your data is secure and encrypted. You can specify exactly who inherits your estate and set out your funeral wishes. Very happy to have received this service free of charge.. I now have peace of mind that I finally got my will organised. Very quick and straightforward way of writing your own will. “Hallelujah” they really do what they say and the whole process was so easy. Yes. 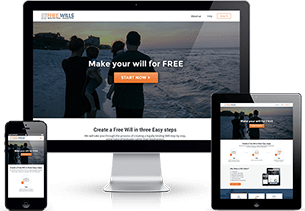 All wills created via this website are 100% free. There are no catches. There are no hidden costs. We make a small affiliate commission on add-on products, through partnerships with reputable companies; and through discreet advertising on the web site. We feel that if you make a will for free with us, you are more likely to use us for other services in the future. Our mission is to change the way people get wills. Some 60% of adults in the UK don’t have a will, meaning that well over 30 million people run the risk of having their estates distributed according to the laws of intestacy. We want to help change that. Yes. There is absolutely no need to use a solicitor to draw up your will. We have worked with expert legal advisors to ensure all our wills are fully legal in terms of the wording. Most solicitors use a boiler plate template, whereas our system will ensure we create a fully personalised will for you. Our unique software lets you create your own comprehensive fully legal last will and testament from the comfort of your own home, without you having to visit a solicitor's office. You can take as little or as long as you need to complete the process, and we provide you with helpful step by step guidance along the way. You will be pleased to know we are full members of the Society of Will Writers. You have to be aged 18 or over; be 'of sound mind'; understand what is in your will; and be making the will voluntarily. For a will to be legally binding, when your will is complete, you need to sign it in the presence of two witnesses (who can’t benefit from your will), both of whom must add their own signatures. The correct wording and the correct signing and witnessing of the will are what is needed to make it fully legal. Our online will writing service generates a fully legal will that states what you would like to happen to your possessions when you die, names an executor(s), nominates guardians for your children if applicable, and specifies your funeral wishes. Our will writing service is not suitable if you own or part own a farm, own a business, have property overseas, if you want to set up a Trust, or where you have wishes that could be considered contentious. We provide you with a series of structured easy to follow questions in plain English for you to answer to create your own personalised will. You can complete your will for free, preview it for free, and download it for free. There are absolutely no fees at all. For the vast majority of people, it will take less than fifteen minutes. If you need longer, then that's fine as our system auto-saves each section for you. Yes, you can easily make changes to your will. You can make as many changes as you like, for free. Executors are either individuals or an organisation that you appoint within your will to deal with all aspects of your estate after you’ve passed away. After applying for legal authority to deal with your estate (known as probate), the executors will ensure that all your assets are accounted for and paid into your estate and after any debts and funeral expenses have been paid, they will ensure that the estate will be distributed in accordance with your will. If you die leaving children under the age of 18 and there is no other person living who has parental responsibility, you can choose who you would like to be their guardian in your will. The guardian(s) will be responsible for looking after your children as they grow up, having control over their welfare, health and schooling. Witnesses are people who see the act of signature add their to and add their to add their signatures and names to the will to prove this. By law your will needs two adult witnesses. The witnesses do not commit themselves to anything by adding their details; they simply witness you signing the will. You can either store your will safely at home or you can pay for a will storage service, such as that provided by most will writing companies, other organisations such as the co-operative society, a solicitor or with the government’s Probate Service. We will email you further details of our recommended service once you complete your will. Caution: Do not store your will in a bank safety deposit box, as the bank might not be able to release the contents of the safety deposit box without a grant of probate, and a will is required to apply for a grant of probate! If you die without making a valid will (also known as dying ‘intestate’), your estate goes to your ‘next of kin’ which is usually your husband or wife, or if you are unmarried, your children. If you have no family members close enough to inherit, the government will keep everything. Without a will, your loved ones will have far more work to do after your death and it is highly likely that your possessions will not be distributed the way you would want. With no recognised document for the administration or distribution of your possessions, the government rules will stipulate who will inherit, and this typically results in negative tax consequences, heartache and lost time and money for your loved ones. Remember, our mission is to change the way people get wills. We will provide you with a high quality, convenient, easy to use online will writing service - and best of all it won't cost you a penny. Still have questions? Explore the glossary or help sections or contact us. Do you live in England or Wales? Sorry but we are unable to help you. Please enter your details below and we will be in touch. Thank you. I am of sound mind and am voluntarily making this Will. Yes, we can help you create your will. 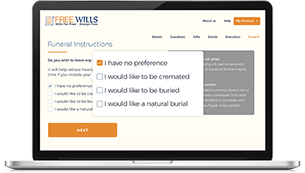 FreeWills is an online will writing service. We are not lawyers and do not provide legal advice.